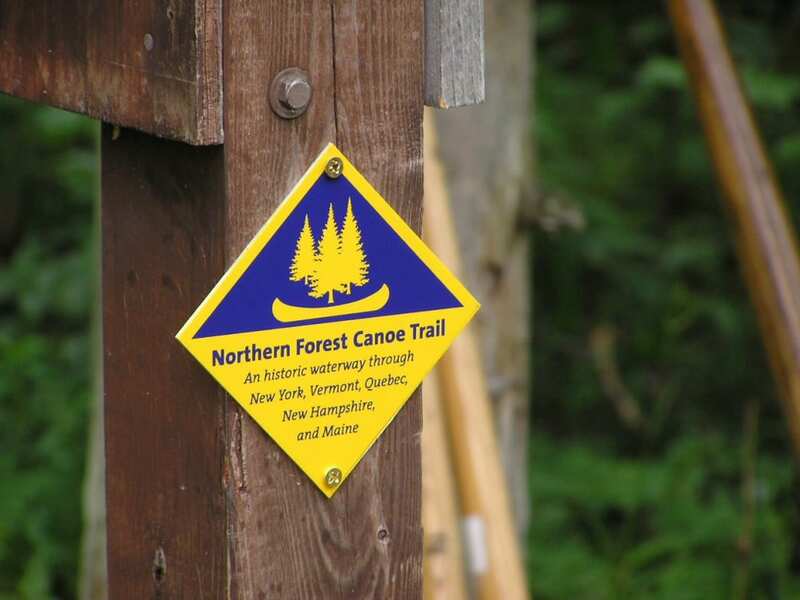 The Northern Forest Canoe Trail is the longest canoe trail in the Northeast. Stretching for a grand total of 740-miles, it winds from Old Forge, New York, to Fort Kent, Maine, passing through the vast Northern Forest, New England villages, and rugged scenery. Paddling it end-to-end means navigating twenty-two rivers, fifty-eight lakes, and over a dozen watersheds, ducking into Canada and traversing wide swaths of backcountry. Of the eighty-seven paddlers who’ve completed the trip since the trail was established in 2006, only twenty-five have been entirely self-propelled, navigating upstream sections and portages using nothing but grit and muscle. If you think you could be the next on the list, all you need to do is show up in Old Forge with a boat and paddle, ready to power your way through thirty million acres of boreal forest and northern hardwoods, following routes that Native Americans have traveled for thousands of years. It’s the challenge of a lifetime for any paddler—here’s what you can expect along the way. A trail marker along the Northern Forest Canoe Trail. There’s a reason that Native Americans and early European settlers used rivers and lakes to get around the Northeast: water cuts roads through impossibly thick forests, and offers the path of least resistance through the Adirondacks, Green Mountains, White Mountains, and Maine’s Mahoosuc Range. That doesn’t mean it’s an easy trip. Through-boaters make the trip from west to east to minimize upstream paddling, but you’ll still need to paddle 130 miles against the current, fighting gravity as you transition from one watershed to the next. And come prepared for land crossings, as well: there are sixty-three portages along the Northern Forest Canoe Trail, for a total of fifty-three punishing miles. While some are a quick trip over smooth ground, others cross narrow trails broken by roots and rocks. Paddlers using boat carts report snapped spokes, flat tires, and bent axles that can’t take the rugged terrain. Penobscot Indians called their canoes agwiden, which means “float lightly.” Taken as packing advice on this portage-heavy adventure, it’s an excellent suggestion. 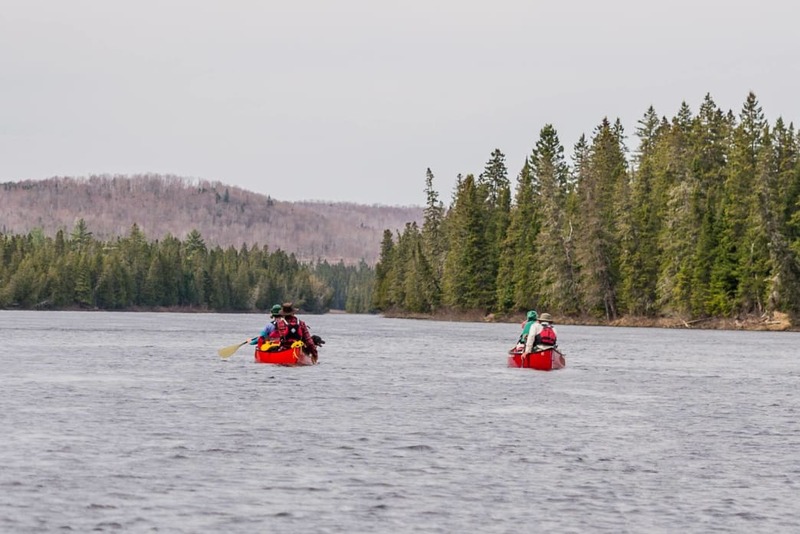 Through-paddling along the Allagash River in May 2016. While there are long stretches of smooth water, the Northern Forest Canoe Trail gets exciting when it bucks and swirls through rapids up to Class IV, powerful water features that must be scouted ahead of time and run with care. Fortunately for less experienced paddlers, the hardest sections can be portaged, adding a bit more overland time to your trip. And rivers aren’t the only places along the trail with breaking waves: as wind sweeps across the largest lakes on the route, it puckers the water into ocean-like rollers that can be challenging to navigate. Most paddlers build an extra few days of water time into their passages, so they can sit out unfavorable conditions rather than risk a dangerous crossing. 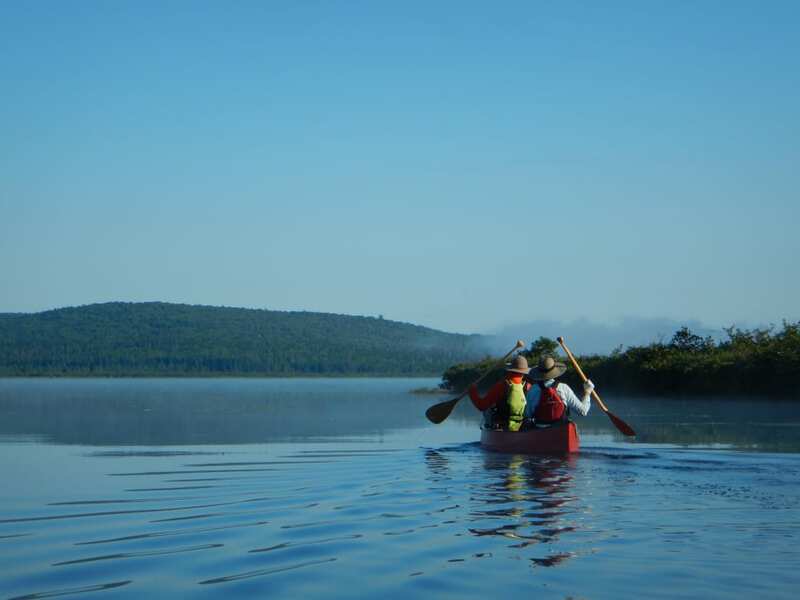 Through-paddling the Northern Forest Canoe Trail is a great way to experience the beautiful backcountry of the Northeast. Pack your paddle, your PFD, and your passport. Traveling the Northern Forest Canoe Trail means checking in at the Canadian Border in East Richford, Vermont, then ducking back across in Leadville, Quebec. Law abiding paddlers are welcome, though this area has a colorful history of smugglers and bootleggers. After returning from Quebec into Vermont, keep an eye on the clear waters of Lake Memphremagog, which was once a favorite route for rum runners trying to sneak booze into the United States during Prohibition. According to local lore, smugglers with boats full of alcohol dodged bullets in the caves along the lakeshore, and some boaters swear that there are kegs of moonshine, guns, and even a few bodies under Memphremagog’s clear water. There are no more whiskey road blocks to dodge along the Canadian border, but the Northern Forest Canoe Trail does pass through two lakes—Lake Memphremagog and Lake Champlain—that are home to a legendary pair of long-necked monsters. Memphre and Champ have been appearing in unsubstantiated accounts and blurry photographs for hundreds of years, and both the Iroquois and the Abenaki told stories about human-eating lake monsters. 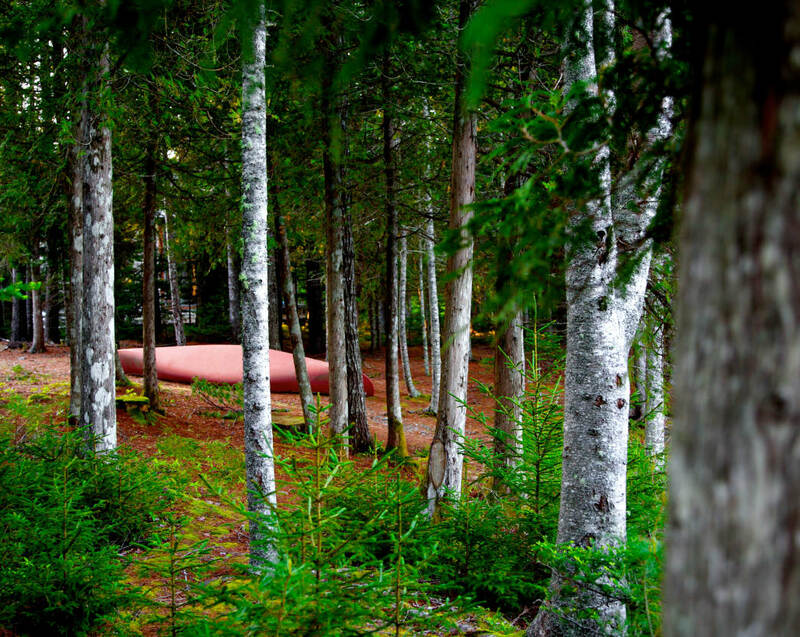 Through-paddling the Northern Forest Canoe Trail. While the Northern Forest Canoe Trail passes through wild country, it’s not exactly an untracked wilderness. These sinuous rivers and broad lakes are the historic hunting grounds and homes of the Algonquian and the Wabanaki, who traveled by lightweight wooden canoes covered by inside-out tree bark. From Lake Umbagog to Umbazooksus Stream, a map of the trail is a roll call of Native American names, and learning their meanings is a reminder of those who have come before. The route is filled with geologic and natural waymarkers, too. Northeastern states were raked by the mile-thick Laurentide Ice Sheet that shed lake-sized ice cubes as it retreated up north, and flooded parts of New York and Vermont with seawater (you’ll float right past the fossilized remains of whales and whelks). Though you’ll pass through towns, resorts, and farmland, much of the Northern Forest seems even wilder today than it did a century ago. In the mid 19th-century, the northeast was the leading timber producer in the world, but log runs and backwoods timber camps have given way to thick, second growth forest that’s home to moose, black bear, and the occasional mountain lion.